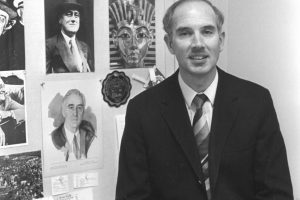 Henry Sharp Jr., Professor of Mathematics Emeritus, dies at 94 Sharp taught at W&L from 1983-1991. Henry Sharp Jr., Rupert and Lillian Radford Professor of Mathematics, Emeritus, died Sept. 23, 2018, in Lexington. He was 94. A native of Nashville, Tennessee, Sharp received his B.A. in civil engineering from Vanderbilt University and his M.A. and Ph.D. from Duke University. He served in the Army Corps of Engineers during World War II in the Pacific Theater. Before joining the W&L faculty as head of the Mathematics Department in 1983, he taught at Georgia Institute of Technology and Emory University. Sharp retired from W&L in 1991. Sharp’s research interests included graph theory and combinatorial mathematics, and he received an NSF grant and an NSF science faculty fellowship to study these topics. He published numerous papers for professional journals and wrote four pre-calculus textbooks. After retirement, Sharp volunteered as a mentor/tutor in the Lexington and Rockbridge County public schools, where he earned the esteem of many young students, parents and teachers. He joined the board for the Kendal at Lexington Retirement Community, and he and his wife were among the earliest residents there. He continued his lifelong interest in education by offering a number of short courses in mathematics for fellow Kendal residents. He is survived by his son, Henry Kerr Sharp, and daughter, Margaret Lewis Sharp. Tagged //mathematics, obituary, Rupert and Lillian Radford Professor of Mathematics, Henry Sharp Jr.